Q Where can I find the Easter Eggs on the Red Dwarf DVDs? A To read the answers below, simply highlight the 'invisible' text with your cursor. Disc 1: Highlight 'Select Episode' and click right to highlight the number clipboard. Hit select to travel to the vending machine, then enter the number 4691 (as seen on the clipboard) on the keypad. Disc 2: click right on entering the Bonus menu to highlight the item in Lister's bunk, then press select. Disc 1: From the main menu, click down until you have highlighted the watch on the desk, then press select. You will be taken to the Holly Hop Drive. If you want to start it, press start. You can work out the rest of the controls for yourself. Disc 1: Watch for this after the closing credits for Marooned. Disc 2: Enter the photo gallery and select 'Models and Covers'. Skip through the images until you reach a schematic drawing of Starbug. Click up to highlight the picture and press select. Disc 2 - Animated Menu: On the bonus menu, wait for the Polymorph to become a white rabbit, then highlight and select it. Disc 2 - Plain Menu: Press left from the 'Back' option to highlight the Polymorph, then press select. Disc 2 - Animated Menu: Wait until the matter paddle appears, then highlight and select it. Disc 2 - Plain Menu: Press left from the 'Back' option to highlight the matter paddle, then press select. Disc 1: Enter the scene selection menu for DNA and go to the second screen showing the last four chapters. Highlight the egg being laid by the chicken and press select. Disc 1: Head for the scene selection menu. See the Inquisitor's glove? Highlight and select it, then you'll be asked to enter three digits. GD is the clue here - it stands for Gamma Delta. Still don't recognise the reference to the code Lister punched into the glove? Never mind - the number that follows in the episode quote should be 145. Disc 2: Head for the subtitle menu and press 'up' to discover a familiar silhouette. 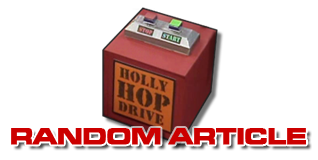 Select the image for yet more Red Dwarf USA-related chatter from Doug Naylor and Robert Llewellyn. Disc 1: Insert your disc and watch the opening sequence. When you reach the Starbug airlock, you will have a few seconds to press 'select' before the light changes colour. Do so, and you'll be taken to a star map above the scanner table. Clicking 'You Are Here' will reveal film footage of the cockpit, while planets SVC1 and SVC2 show some of the animations created, by post-effects house SVC, for the series. The other planets do nothing, but are generally named/numbered as a pun of some kind. Plus, don't they look pretty? Disc 1: Go to the episode selection menu and select Gunmen. Then navigate over the sheriff badge and hit 'select' to see Rob, Doug and Ed talking about the episode... and wearing some most disturbing outfits. Disc 1: From the main menu, highlight 'commentary' and press left. The airlock sign will be highlighted, so press 'select'. You will be asked to enter a number on a keypad; the 'ginger toupee' clue is a reference to a Space Corps Directive. Enter the number 1742 and this will take you to a splendid Danny John-Jules interview outtake. Disc 3: From the main menu, highlight the ammo dispenser on the left. Select the live (red) ammo and watch as the Doom-esque animation shows you picking up a bazookoid and pointing it at the airlock controls. When the shot is lined up, press 'select' to fire. You'll be taken to the AR suite and shown exclusive footage from Chloë Annett's audition tape - including a dialogue exchange eventually cut from Ouroboros. Disc 3: Do exactly the same as above until your bazookoid is pointed at the airlock door controls. Then press 'down' to highlight a second light on the side of the weapon. Press 'select' to fire and be taken, once again, to the AR suite - where this time you'll be shown a movie-esque Red Dwarf trailer voiced by Epideme actor Gary Martin. Disc 3: When choosing your ammo (above), if you select blank (blue) rather than live, you'll still tool up your bazookoid, but when it comes time to fire at the door controls... well, all you'll achieve is a bit of a scorch mark and a return to the main menu! Disc 2: From the main menu, scroll down to Subtitles and then press right to highlight the elevator buttons. Press 'down' 12 times, until you reach button number 13, then hit 'select'. You'll be taken to a briefcase on Floor 13 containing the luck and sexual magnetism viruses. Select the (blue) luck virus and - bad luck! - the test tube breaks and the fluid leaks away. You'll be returned to the main menu. Select the (red) magnetism virus and you'll be shown a video for 'Clear' by now-defunct band Intro2. The video features Craig Charles, Norman Lovett and Danny John-Jules. Disc 3: Highlight Bonus Material on the main menu and hit 'select'. When the camera swings around to view the (closed) elevator doors, hit 'up' twice. A button will light up to the side of the door. Hit 'Select' to push it and the doors will open, revealing a skutter having some trouble with a faulty gangway. After learning the skutter's fate, you'll be shown a series of outtakes from the Series VII and VIII DVD interviews... mostly involving people's inability to switch off their mobile phones. Bodysnatcher Disc: In the Subtitles menu highlight and select 'on' to activate the subtitles. 'Off' will now be highlighted, so push 'up' on your remote, which will highlight the stars of the JMC logo. Press select to hear a discussion about Spitting Image from the Red Dwarf creators. 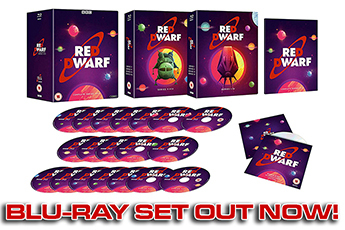 Red Dwarf Disc: Go to the Bonus menu and highlight 'DVD Credits'. Press right to reveal a hidden bowl of soup and press select. 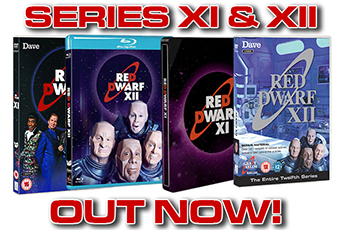 You will be shown two archive clips - a Smeg Up and a Krytten introduction - that were mistakenly not included on the Series I and VII DVDs respectively. Disc 2: Insert and play the disc. When the skutter appears and gives the two-finger salute, press 'enter' on your remote - you'll be treated to an extra piece of behind the scenes footage which shows Danny John-Jules fleeing the sci-fi store shooting to grab a free glass of champagne... and the ADs attempting to get him back.